Toilet Protection system that includes securing bands to keep the contractors out ot the toilet. Surface Protection International manufactures secure fixture protection for all surfaces including toilets. 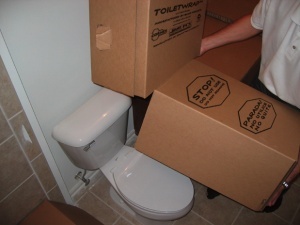 ToiletWrap toilet protection is designed to protect the toilet throughout the construction process. ToiletWrap toilet protector comes with securing zip ties to lock toilet protection onto toilet. The lock prevents use of toilets by contractors and helps to provide a clean toilet to your customer. Complete toilet protection system that includes securing bands to keep the contractors out ot the toilet.